Do your feet get tired from terrorizing whole cities at a time, particularly after climbing all the way up a skyscraper? 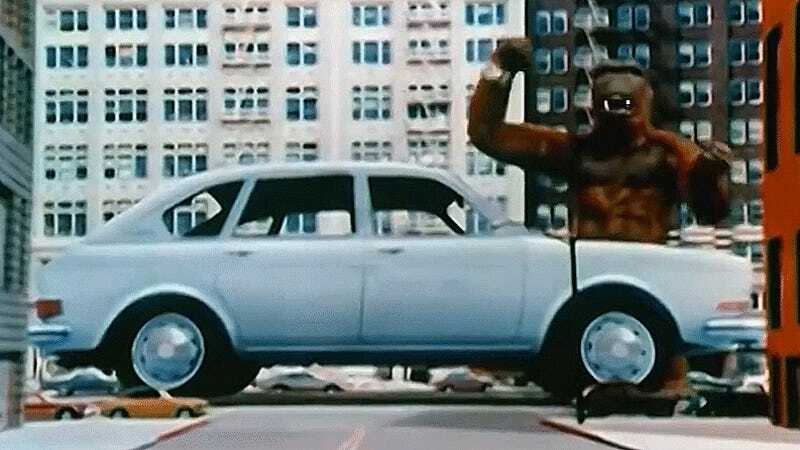 You, giant mayhem creature, need a Volkswagen 411: the big Volkswagen. Sadly, the Volkswagen 411 suffered the same fate as the much later “luxury” Volkswagen Phaeton—it just didn’t sell very well. At the time, it was pricier than a comparable Chevrolet Nova—which was the real proper comparison, as the 411 was merely roomy but not as luxurious as this ad would have you think. Buyers and contemporary reviewers also couldn’t shake off the idea that it was just a bigger Beetle, as Curbside Classic notes. So few of these are left on the roads that most people don’t even know that my 411 is a Volkswagen, much less that it’s not some run-of-the-mill old Passat or something. Now when someone asks what my 411 is, I have my answer thanks to this ad: a car made for gargantuan destructive horror creatures.